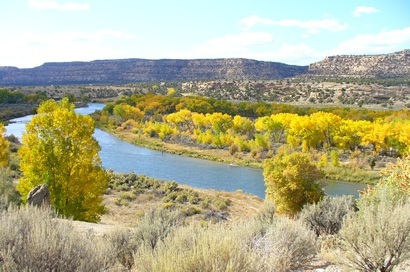 Fly-Fishing in New Mexico's San Juan River. Before I left for New Mexico last month, where I was for the first time, to try my hand at fly-fishing, I spent some time producing my fish story. I thought I would need one. Standing in front of the bathroom mirror I held my hands out, trying to see just how far apart I could stretch them before believability in a potential fish’s size became as elusive as the animal itself. During that trial run, it was about this large. Until two weeks ago I had not picked up a fishing pole in several years. And in Texas, that oversight could be translated as heresy. The last time I fished was when I took my son to Matagorda while he was still in elementary school. We fished at the estuary where the Colorado River empties into the Gulf of Mexico; where Texas becomes liquid. We had stood in a single file row with many others also hoping to craft some family histories by dipping their poles into the brackish waters. Standing along the bank, swatting at flies as large as locusts, we dug our hands into a bag of stinking, dead shrimp that we had been assured would make the fish just crazy enough to leap into our laps. It worked. Once. My son caught a great, one and a half-pound something or other with the rod and reel combo set we had purchased at the El Campo five and dime. I caught a great mosquito with my leg. 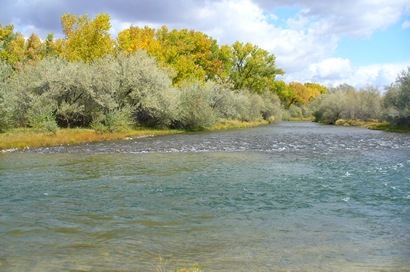 Equipped, vicariously, with my son’s now decade-old success and my own fiction, I arrived at the Soaring Eagle Lodge in New Mexico ready to take instruction in fly-fishing. For the record yes, a River does Runs Through It- the San Juan. A full, beautiful winding passage that cascades through a cottonwood dotted valley conducted from the Navajo Dam a couple of miles up river. The Lodge takes up position at a curve where two branches of the river meet, creating rapid, white-frothed currents of the frigid waters. The vision I had of myself that morning was dismal. I envisioned being entwined, head to toe, in fishing line, the rod’s tip protruding through the mess; a frazzled top spun from the hand of an angry child. By morning’s end I fully expected to be encased in twine, defeated and mummified in a solution of string, bait and lure and left as a sort of totem warning to future fishermen- a monument to those who plan poorly the adventures of the Great. But the day had softer, less violent plans for me. Perhaps the spirits that wander the valley take pity on the inexperienced. If the Lord watches over drunks and fools then I’m covered on at least two sides. I, along with a couple other writers, were led down to the bank of the river after watching a video that shown several broad-smiling men and women landing trout after enormous trout. There were many pictures of cigar-accented doctors and businessmen standing hip-deep in the river clutching 12-28 inch trout. Every scene of the film illustrated the ease with which any and all could catch those speckled, rainbow and brown trout that were literally teeming in the waters just outside. To watch the video was to be certain of success. It appeared that all that was necessary to capture one of these fish was to stand near the waters, pole in hand, and the trout, fully instructed in their duty, would obligingly take whatever bait was dropped on them. As we walked down to the riverbank I was already wondering what I was going to do with the three or four fish I was sure to collect. I’d taken no measurements but I was reasonably sure that the refrigerator in my hotel room wasn’t adequate for the trophies I was about to acquire. The rods and lures had been neatly displayed in the grass at the river’s edge. The clutch of poles reminded me of the Greek doru, spears common to the hoplite. Long, slender and designed to deliver death at a relative distance, the instrument seemed ideal for my purposes. So armed, I advanced on the shore. In a word, I was ready. Ready to become richer in treasure and stature. Ready to become a better man. And there they were. In the cold, clear waters, I could make them out darting here and there, snatching at insects too small for the human eye to discern. Some breaching the river’s surface, chasing flies that had ventured too close to their own reflections, others roiling the silt pushing their snouts after larvae that we had been told were their favorite food source. Here, in our bend of the San Juan River, the water (“Quality Water” they call it) was littered with our foe, our sport, our dinner. The fish were so obvious, so close at hand that I was tempted to grab a pole and swat at them; to reach down and try to grab one straight out of the water. (I was told that wasn’t cricket.) Nevertheless, seeing them so near, so tempting I was eager to get the lure on my line and begin casting. However, we still needed to be taught how to use the equipment because fly-fishing actually is the effort that it seems. After the casting lesson he produced a small box of lures (there was not a red, plastic worm in the whole lot so I was lost from the outset), which were truly marvels of engineering. Each was handmade, the threads woven so precisely around a barbed hook that I thought back to those medieval scribes whose jobs were to replicate ancient texts, in many cases spending their entire adult lives copying the same lines over and over and over, ad nauseum. I envisioned the lure-maker bespectacled, bent over a wooden table, twine in one hand, a pair of tiny delicate scissors in the other. He would be looking through a large, round magnifying glass at a lure held and suspended on a vice. The table and floor littered with the detritus of years of labor, objects foreign to anyone but himself, the only sound coming from the dark, smoke-filled room being a mumbled curse from a hook’s prick. “It’s not that hard. I stitch ‘em together in the back room there in the store,” the instructor said. “Oh,” I said. “Oh,” I said. And then, all at once, I was ready. With the pole in hand and instructed on its use, the line decorated with my black streamer lure I was, all at once, ready to throw my first fly-fishing cast. And then, all at once, the trout were gone. Lord only knows where those fish went that morning. Maybe they had their fill of breakfast and swam off to do whatever it is that fish do. Maybe the property’s Labrador scared them away when she began chasing a rock into the river. Maybe the trout, on seeing me fully prepared and instructed, thought better of their situation and high-tailed (finned) it out of there. I like that one. Faced with such a situation, I did what needed to be done. I learned to fly-fish. I stood on the river’s edge for about an hour casting over and again until the motion felt more relaxed and natural. I kept throwing the line until the effort ceased to feel stilted and jerky. Pulling the streamer across the water’s surface, I felt certain that, if a fish had been looking, it would have seen an actual fly hovering at a natural pace on the water. Once I felt the line pull taut and saw the lure disappear. Excited that maybe I had finally hooked a live one I looked around trying to get the attention of the instructor. However, it turns out that all I had caught was the attention of a small bush off to my right. Just over an hour after starting, it was time to leave the lodge and return to the hotel. During the ride back the other guys related that not only had they seen trout but they had had more than one nibble. One of them even insisted that a large rainbow trout had taken his bait once, but he had lost it when he pulled too hard on the line and the hook came free. Looking back now I’m a little envious that he was able to come up with his story right there on the spot. I’d been at mine for a few days and still had nothing. I left hoping that the mirror in the hotel’s bathroom would be wide enough for me to finish my story. By my calculations, it needed to be about this big.